Robin does not like eggs, but she does have a few egg dishes she loves. When I asked the kids what they wanted to do for Mother`s Day Breakfast, they said her absolute favourite egg dish: Quiche. 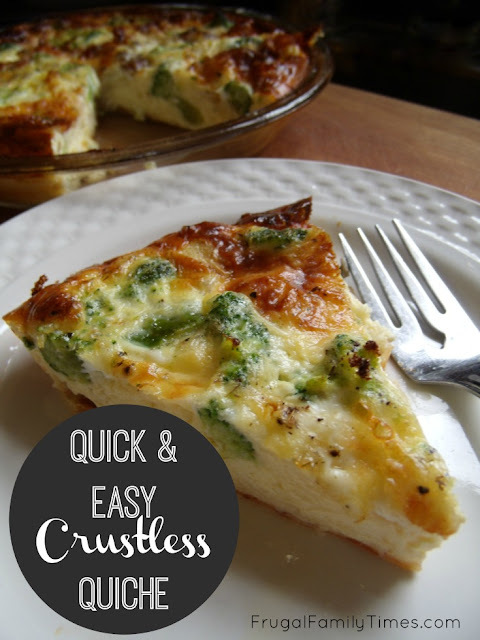 This simple, crustless quiche is great for days (and dads) who want to make a fancy, delicious breakfast, but with little labour and clean-up (its early in the morning, damn it). 1. Spray a 10" glass or ceramic pie plate liberally with non-stick spray. Toss the cheese and flour in the plate with a fork, working it around to coat the plate and the cheese. 4. Carefully transfer the quiche to the oven and cook for 30-40 minutes (frozen veggies will vary the cook time slightly). Check with a knife after 25 mins - the quiche is done when the knife comes out cleanly when inserted in the middle of the quiche. It needs to rest for 10-15 mins after it comes out to cool and set. Run a knife carefully around the edge, slice and enjoy. And what about the clean-up? 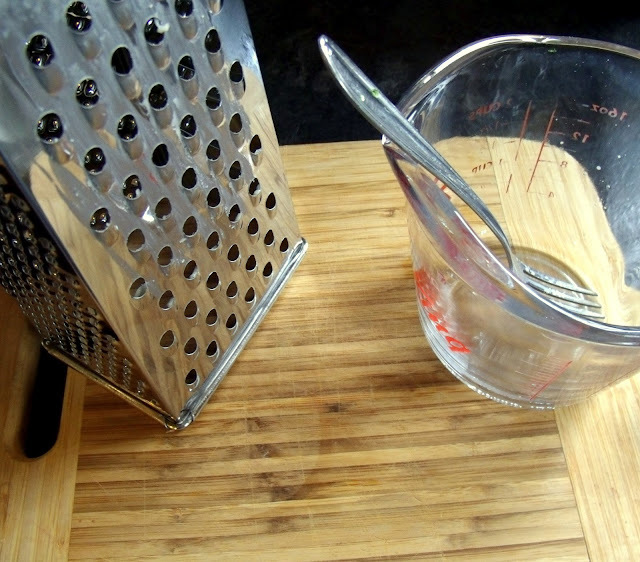 A cheese grater, measuring cup, chopping board and fork (I used the same fork to scoop out flour, toss the cheese and eventually mix the eggs. You can totally wash that up while the quiche cooks. I know you'll still have time leftover - I wrote most of this post during the cook-cool time. Spray a 10" glass or ceramic pie plate liberally with non-stick spray. 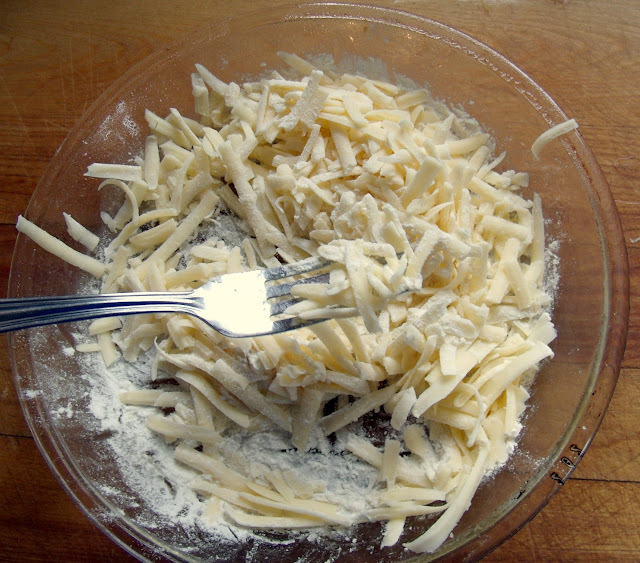 Toss the cheese and flour in the plate with a fork, working it around to coat the plate and the cheese. 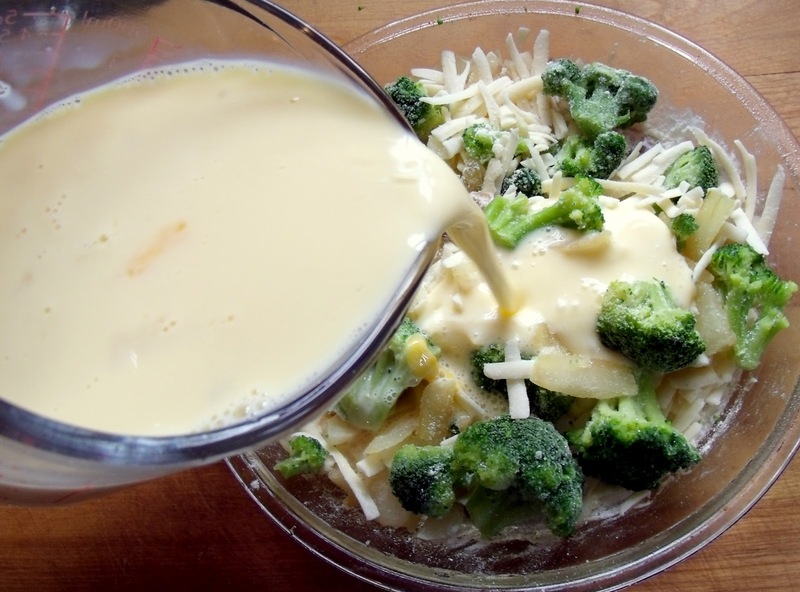 Toss the frozen Veggies in and mix them with the cheese just enough to distribute everything evenly. 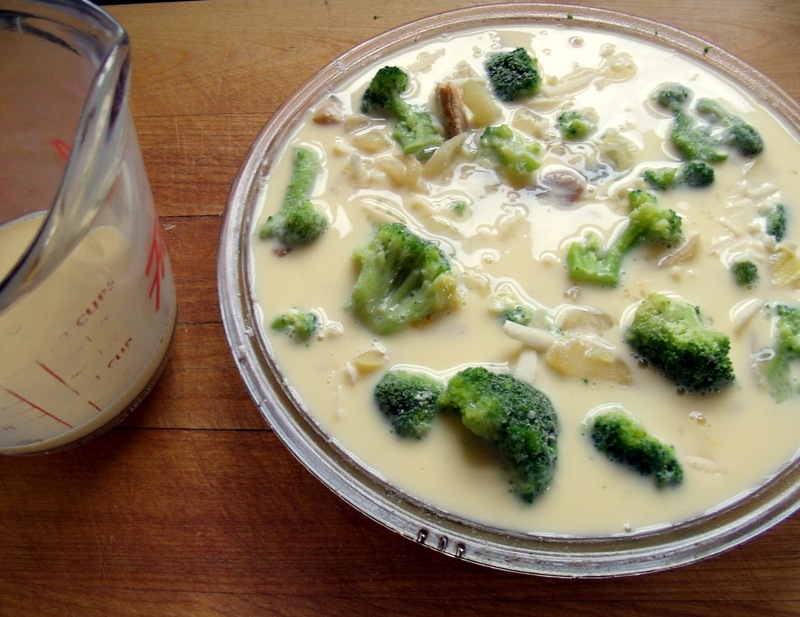 Mix Eggs, milk and cream together in a measuring cup. Whisk until thoroughly mixed. Slowly pour the mixture over the whole quiche. 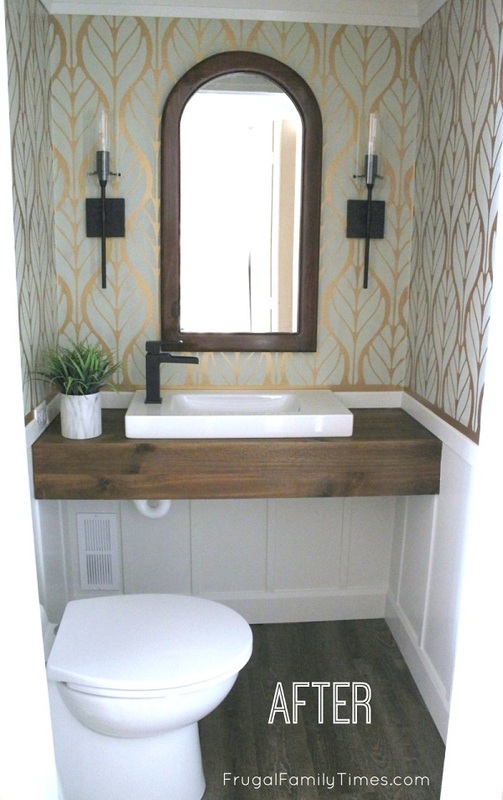 Make sure is has a chance to let the eggs sneak into all the nooks and crannies. 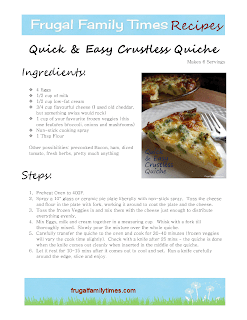 Carefully transfer the quiche to the oven and cook for 30-40 minutes. 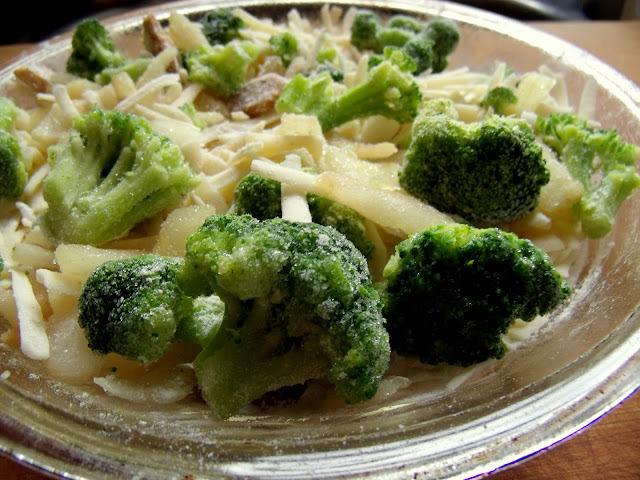 (Frozen veggies will lengthen the cook time slightly). Check with a knife after 25 mins - the quiche is done when the knife comes out cleanly when inserted in the middle of the quiche. It needs to rest for 10-15 mins after it comes out to cool and set. Run a knife carefully around the edge, slice and enjoy! This recipe is too good to forget - so we've shared it again!